Last Thursday, Drago Centro celebrated the launch of its Winter Cocktail Menu with a special one-day discount pricing on its signature cocktails. As with previous seasonal menus, the winter Nuovi Classici menu is a collaboration between Beverage Director Michael Shearin and Head Bartender Jaymee Mandeville. In addition to the “New Classics,” two Classici are featured on the menu: the Americano (Campari, Carpano Antica sweet vermouth, Fever Tree club soda) and the Negroni (Bombay gin, Campari, Carpano Antica). All cocktails on the winter menu are priced at $12. 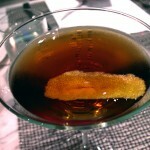 A few days after the launch, my friend Amy and I dropped by Drago Centro for a hosted media tasting of the new menu. Mandeville was out of town, so Shearin was behind the stick for the event. During the first part of the tasting, Shearin made each of the new winter cocktails for us to pass around for straw tastes and quick camera snaps. Afterwards, Shearin took orders, mixed full cocktails and continued to send out an array of Drago’s excellent bar menu items. Because of the format, Shearin was able to introduce the drinks but didn’t have much time to elaborate on the creative process. 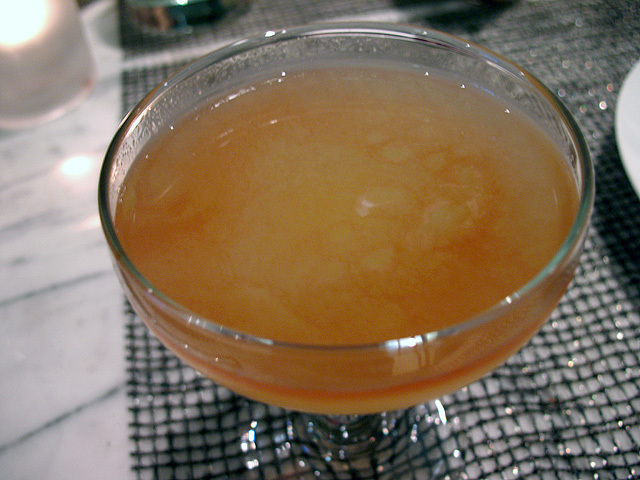 I started with the Cusco’s Crown: Campo de Encanto Pisco, house pear puree, Angostura Bitters and fresh lemon juice. With the outstanding Encanto Pisco as its anchor, this bright, refreshing and balanced cocktail would be just as welcome on a spring or summer menu. Here’s hoping it makes a return appearance. Amy’s first cocktail was the Puro Sangue (“Pure Blood”): Karlsson’s Vodka, Solerno Blood Orange Liqueur, honey and blood orange “caviar.” She really liked it, but I thought the funky earthiness of the Karlsson’s was lost in the sweetness of the Solerno and honey. The boba-esque caviar is a nice touch. 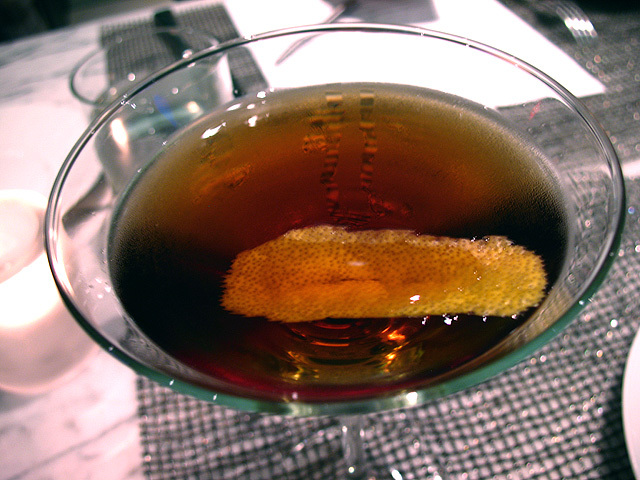 My second round was the Smoke on the Horizon: Zaya Rum, Drambuie, Carpano Antica, atomized Sombra Mezcal and mole bitters. Another well-balanced cocktail, vanilla forward and sweet but with some depth from the bitters and a hint of mezcal smoke on the finish. The hot and delicious January Jones. Amy’s second drink was the January Jones: Appleton VX Rum, demerara syrup, cinnamon tincture, butter, clove, star anise and hot water. 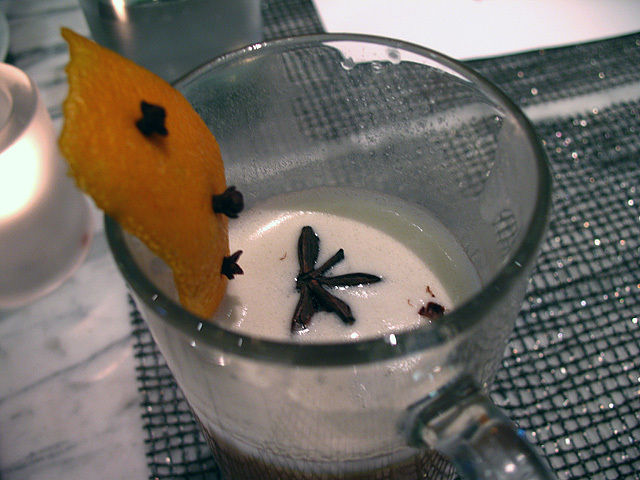 The most wintry drink on the new menu, this Hot Buttered Rum variation was a slam dunk favorite of the table. 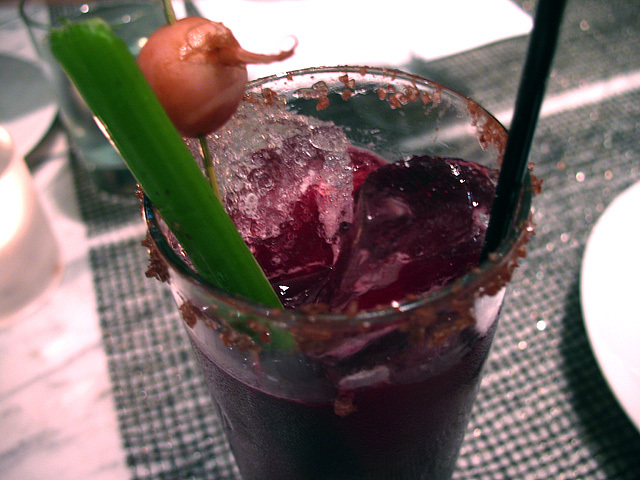 Morning Courage – Bols Genever, serrano tincture, celery bitters, beet, lemon, Hawaiian red salt. I love Bols, but missed its signature maltiness in this tall drink, which favors the beet and savory notes. 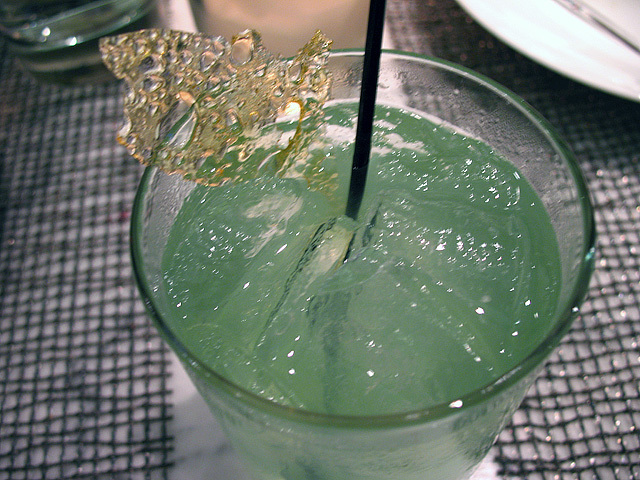 A few others at the table ordered the Unbridled: Laird’s Applejack, Green Chartreuse, lime and mint. 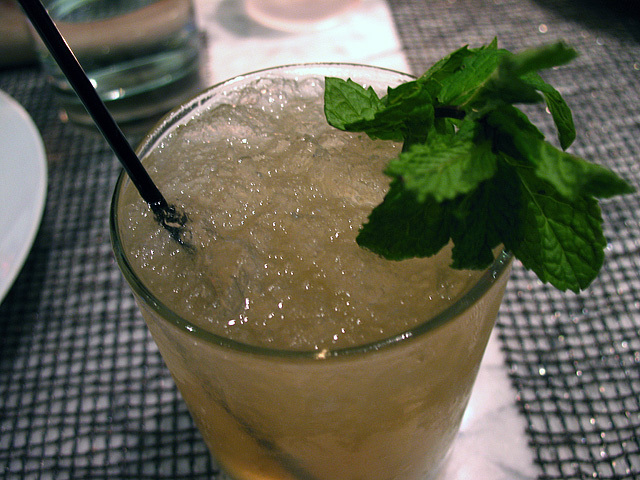 This Mint Julep variation (named after the 1990 Kentucky Derby winner) was nearly as well-received as the January Jones. 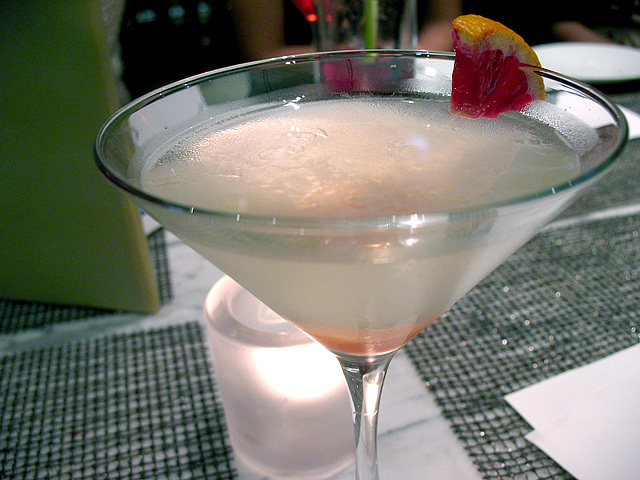 Violet Femme – Real Blanco Tequila, Luxardo Maraschino Liqueur, Crème de Violette, Ventura Limoncello and yuzu. 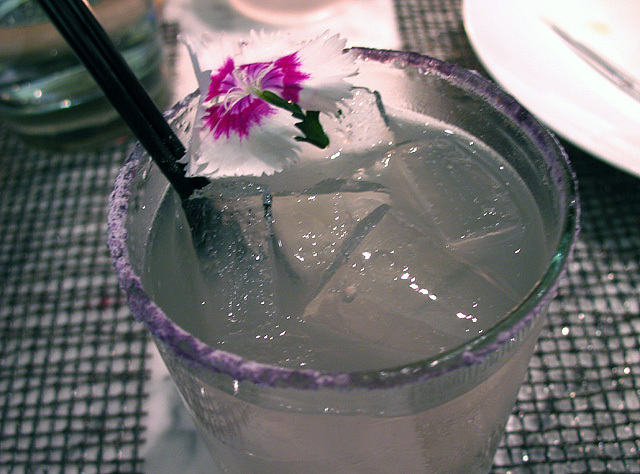 Quite the beauty, with its flower garnish and crushed violet rim. It’s meant to be enjoyed without a straw and naturally has a very floral profile. Watcher in the Woods – Death’s Door Gin, Clear Creek Douglas Fir, Nocello, lavender syrup, Mint Bitters. With its interesting ingredients, vivid mint green color and candied garnish, the Watcher in the Woods is certainly an attention-grabber. Unfortunately this was my least favorite of the new cocktails. It’s possible my palate wasn’t ready for the eau de vie, but I was hoping for more of the Death’s Door, one of my favorite gins. Shearin compared the Watcher in the Woods to some of the more esoteric wines in the Drago Centro collection, bottles that challenge most customers but that eventually find fans. I’ll definitely be back to have a go at the cocktails I only sampled, as well as reacquaint myself with returning favorites such as the Greco Roman, Smitten with Britain and especially the Smokehouse. I may even give the Watcher in the Woods another look.